Height adjustable benches, the idea may sound simple enough but finding one that is best suited to you and your environment can be tricky, that is why we have put together a quick guide for the most popular uses. The beauty of an adjustable workbench is that it is flexible enough to accommodate your job and role if and when it changes. You can also find the workbenches in an array of different worktop surfaces to suit your job. Including MFC, Laminate, Lino and Hardwood. The workbenches also come with a range of accessories, including back panels, lighting, support rails and even electrical service ducts. 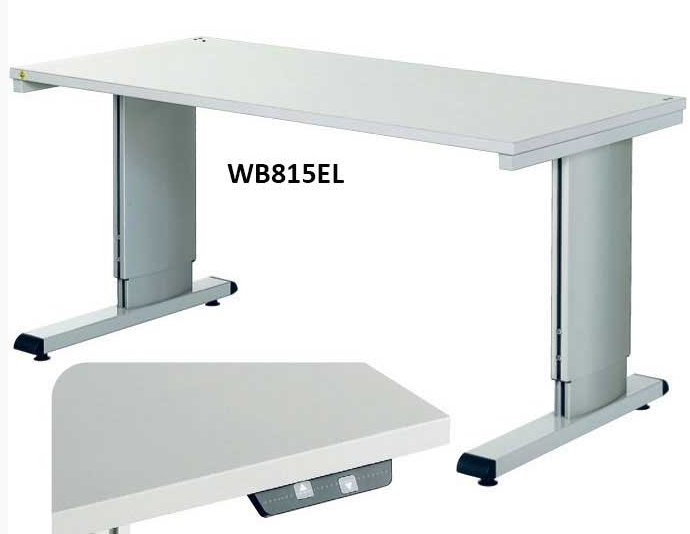 Height adjustable workstations are ideal for light to medium duty applications, because they come in a variety of sizes means that it will suit almost any work area. And with its adjustable height it means that the shortest and tallest of your employees can work next to each other in total comfort (apart from any banter that may be flying between the two of course). Ideal for packing facilities or assembly lines in factories and warehouses. 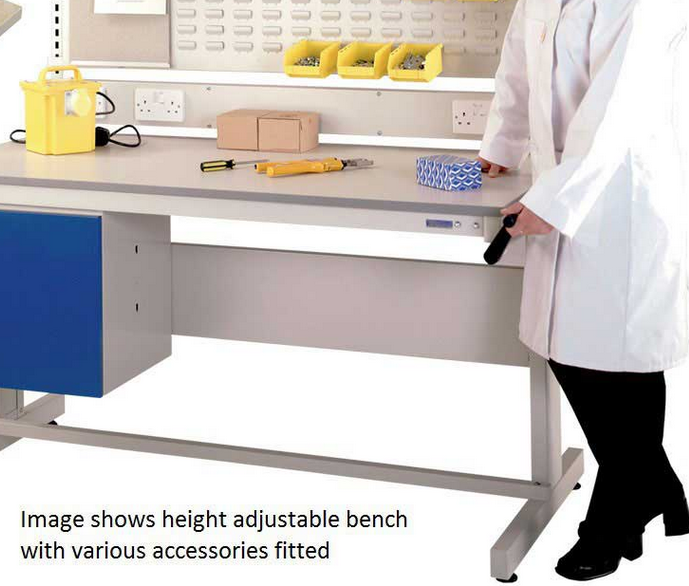 The height adjustable mobile bench can suit a variety of needs, from extending workstation work surfaces to utilising small work areas. Being able to adjust the height to match that of your workbench or work station offers total flexibility when needed either in your workshop, in a packing or assembly factory. Featuring a laminated particle board top means that it is incredibly easy to keep clean tidy when not in use, as well as the epoxy coated steel body ensuring its durability. 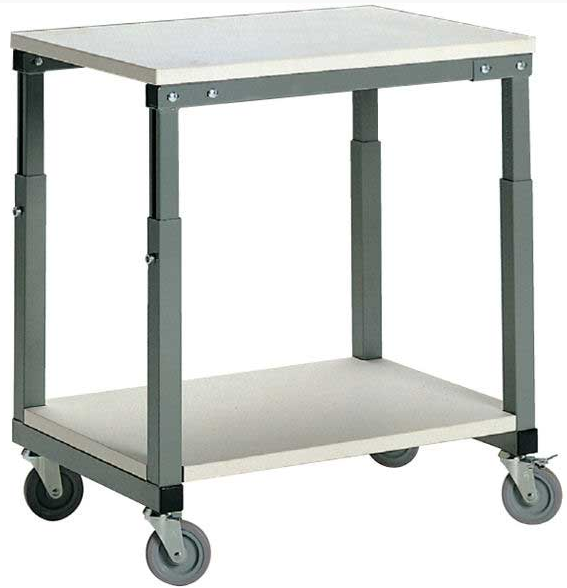 One of the most popular models when it we talk about height adjustable workbenches, the electric cantilever bench. Used in a lot of big corporate offices for its ease to accommodate taller or shorter employees (sometimes sat on the same bank of desks) or in workplaces that encourage standing operation (with the new wave of ergonomic research). It is also suited to a range of industrial environments. 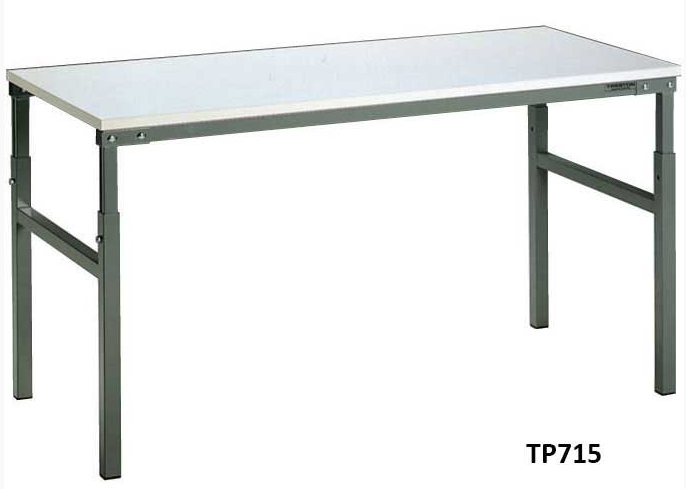 The simplest of all the adjustable benches mentioned, this simple bench is ideal for laboratories with its epoxy coated steel frame, and a laminated particle board which offers durability as well as easy to clean surfaces. Also great for extending work surfaces and can be used in conjunction with the height adjustable mobile bench we looked at earlier. 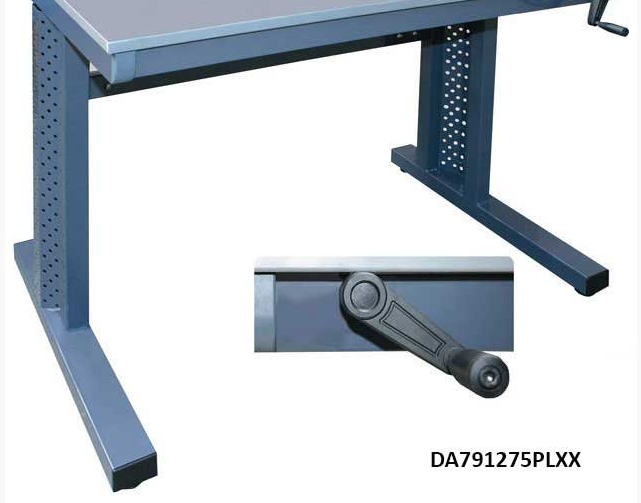 Accessories As mentioned earlier there are a whole range of accessories available for height adjustable workbenches, so you can customise them to your environment and needs, these include. So whatever you need a height adjustable bench for, you can see there is one out there to suit your requirements. If you want to find out more about the height adjustable benches we supply, you can browse online, or call one of our friendly and award winning team on 0808 163 3704.